Have you sent your acting-out, verbally abusive or behaviorally-disordered child to counseling, only to find that it didn’t improve his behavior at all? Or maybe counseling worked for awhile, but then your child fell back into the same old patterns of behavior. Counseling for kids can be effective and helpful, but not all counseling is the same. We sat down with James Lehman to hear what he had to say about finding the right type of counseling for your child—and the kind of training parents need to become the “agents of change” in their families. Sometimes a child’s needs are so huge that therapy isn’t enough—so your child needs more of a foundation at home. EP: James, counseling is an effective tool for parents, but many of our readers report that it doesn’t always work. Why do you think that’s the case? JL: Many kids do very well with counseling and therapy, but there are also a very significant number of children and teens who don’t. I think the reason that they don’t is because their pathology is so overwhelming that 45 minutes in a therapist’s office is not going to address it properly. If your child is in counseling, I believe the therapist should not be the only one who has the training to deal with your child. As the parent, you need to have training available to you to learn how to present a consistent structure for your child. In other words, you need to know the things the therapist knows about how to manage your child’s behavior and how to teach him to solve problems. JL: Many kids come into therapy with basic problem-solving skills. It might be that something is interfering with that temporarily—maybe it’s grief or post traumatic stress disorder from abuse or an accident. But when kids come into therapy and they haven’t developed those problem-solving skills that are appropriate—when their problem-solving skills are basically aggression and giving threats and battling with people to get their way—it’s not just a matter of dealing with the issue at hand and moving on and getting them back on the natural course of their lives. For these kids, they have to learn how to function appropriately from day one. So not only are you dealing with your child’s behavior, but you’re also dealing with the basic apparatus of how he sees the world and solves problems—you’re not rehabilitating them, you’re starting from scratch. I think the term “rehabilitate” is an interesting word because it means “return to its former state.” So you can see where therapy for kids is often rehabilitative. It returns them to their former state of functioning. But rehabilitation doesn’t deal with a large number of kids who never had a former state of successful functioning to begin with. For them, it’s not about returning—it’s about learning appropriate coping skills. These are the kinds of kids who need help in the home. And that’s why I think counseling doesn’t always work—because it’s not enough for them, or for their parents. Again, I think there are many, many kids for whom therapy is just not sufficient. It’s not whether it’s effective or ineffective. In order for a real transformation to take place, the parents have to acquire the skills in the home that are needed to create lasting behavioral change. EP: James, how can you expect an acting-out child to respond to counseling at first? JL: If your child sees his acting-out behavior as his power base, any counselor—or outsider—who challenges that behavior is going to be met with hostility, aggression and rejection because they’re threatening your child’s power base. That’s because if your child is acting out, he’s getting power in your house by using that acting-out behavior. He gets a sense of control. And that’s his personal sense, by the way—you might not look at it that way. But a closer examination shows that in most families, the acting-out kid has more power. He is talked to differently, approached differently, and has different expectations placed upon him. In most families, the acting-out child has raised the family’s tolerance for deviant and aggressive behavior. That’s because his behavior ratchets up your tolerance; you’re going to tolerate more and more, you’re going to accept a broader and broader range of inappropriate actions and comments because you’re afraid of the acting out. So in that sense, it gives your acting-out kid a lot of power and control. And that, of course, is the problem. If your child can get power and control by acting out, then he doesn’t need to learn how to get power and control by solving problems. Most of us get control of our lives by learning social skills: that means learning how to solve problems and learning to function appropriately in society. Kids who act out behaviorally don’t. For whatever reason, they take a shortcut, and that shortcut uses abuse and threats to manage emotional conflicts or functional disagreements. Since this occurs in the home or in the classroom, I think the only thing that’s effective is to empower parents and teachers with the knowledge that they need to deal with this kind of child. Simply put, they need to retrain him and teach him the problem-solving skills he needs. EP: What should you look for in a therapist for your child? And what kinds of questions should you ask when you find one? JL: I recommend that parents look for a therapist with experience in managing behaviorally acting-out children. Working with your child is not the place to get on-the-job training. You want somebody who knows what they’re doing. And then you want somebody who can tell you how to accomplish some of the techniques at home that they use in their office. If they’re trying to get your child to comply more, they need to share the skills and tools they’re using. Remember, therapy is not magic. Therapy is repetition; it’s the development of problem-solving skills. It’s the development of an understanding of self and a lot of repetition and rehearsal in certain patterns of thoughts, as well as certain patterns of behavior. I also want to say that there are no specific guidelines for parents about when to turn to outside help. I think parents should get assessments before they make a decision to enter into counseling. I believe that any kid who goes into counseling should be assessed first by a psychologist or a psychiatrist as to the exact nature of what’s wrong with him. I think it’s very important to understand the basic pathology. There’s a basic pathology, or set of symptoms, that is associated with kids who have oppositional defiant disorder or attention deficit disorder, for example. And I think that diagnosis then drives the counseling that drives the treatment. When you first find a therapist, I would also recommend asking them to do an assessment of your child and develop a treatment plan based on that assessment. The treatment plan should be in writing so that you can see the general outline, and the goals that will be accomplished as well as time frames. I think a good question for a therapist is, “What was your biggest success with a kid and how did you make that happen?” Ask some questions and write them down before you get there. You need to know a time frame for change. Ask, “What am I going to see that’s different in my child’s behavior in eight weeks?” I think it’s important to give your child’s therapist a reasonable timeframe; eight weeks is generally enough time for a counselor to get something going on. 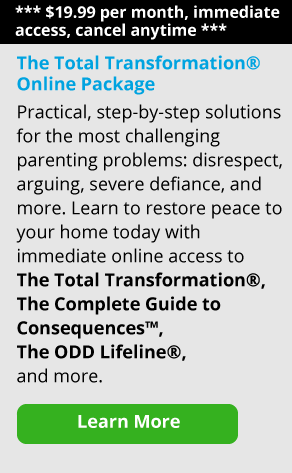 If you’re using the Total Transformation or another parenting program at home, be sure to inform the therapist so you are all on the same page. EP: What would you say to a parent who has sent their child to therapy, but has seen no real change or difference in behavior? JL: I don’t want to criticize therapists or counselors who are doing the best they can. In my opinion, if you send your child to two or three therapists and it doesn’t work, that’s more of a reflection on your child, not the therapists. Sometimes a child’s needs are so huge that therapy isn’t enough—so your child needs more of a foundation at home. I also think that in the mental health profession, there are a lot of child therapists who don’t know how to train parents. That’s not their fault—they weren’t taught in graduate school that this was their role. They were taught that the arena for change is the client. So to them, the kid is actually the focus for change, and not the family. I think successful child counseling comes about if the therapist also trains the parents on how to accomplish things at home. EP: If you have a child with acting-out behavior, do you think a family therapist is a good way to go? JL: Personally, I think a therapist who has experience and training with managing acting-out behavior—and who understands the thinking that underlies the acting-out behavior—is your best option. Family therapy often assumes that the family is the problem, but I think that the family is the arena for change. It’s also where change has to take place. I think parents are agents of that change—but in classical thinking, counselors and social workers are the change agents. I believe it’s the parents—and the teachers—that need the training. In my opinion, the most effective use of counseling time is to empower parents with the tools they need to not only manage their child’s behavior at home, but also challenge it in a way so the misbehavior is used as a teaching tool. This way, parents can be more effective in teaching their child to learn how to solve problems differently the next time they happen. That’s why I believe in empowering parents: so they can become the agents of change in their families.